August 25, 2015. The American Merchant Marine Museum at the United States Merchant Marine Academy (USMMA) at Kings Point reopens to the public, Tuesday, September 1, after renovations. Kings Point, NY - August 25, 2015 - The American Merchant Marine Museum at the United States Merchant Marine Academy (USMMA) at Kings Point reopens to the public, Tuesday, September 1, after renovations. A core artifact of the museum’s collection, a Japanese samurai sword presented by Gen. Douglas MacArthur to the Academy in 1945, was for the first time analyzed by a historic weapons expert. The sword was surrendered at the end of World War II by Vice Adm. Matomu Ugaki, who commanded the Japanese Naval forces of Northern Honshu and Hokkaido. MacArthur presented the sword to the Academy “As a memento to the valiant service rendered by the sons of the Academy in our struggle in the Pacific.” In addition to the sword’s 20th century historic value, this analysis is exposing its value as a historic Japanese weapon. 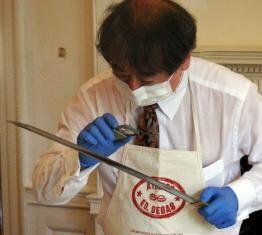 With Interim Museum Director, Dr. Josh Smith, and a half dozen museum staff and volunteers observing, Metropolitan Museum of Art Special Consultant for Japanese Arms and Armor, Mr. Morihiro Ogawa, put on his white apron, surgical mask and gloves to examine the sword. With just a few swift steady expert moves, he disassembled the priceless weapon into its parts in about one minute. Then, very slowly, Ogawa turned the sword’s blade in his hands. Using a magnifying glass and various light sources, he went over blade, examining it from every conceivable angle. Next the sheath underwent the same examination as the staff watched in silence. It’s a “very good sword” Ogawa finally announced. The weapon is about 400 years old, made in the 14th century style. He determined it is a naval-style samurai sword, signifying a high rank. An observer asked for its approximate worth. However, unlike on the Public Broadcast Service’s “Antiques Road Show,” Ogawa noted that by museum policy he could not provide an estimate. The sword is on display at the American Merchant Marine Museum, which is reopening after renovations to bring the building into compliance with requirements of the American with Disabilities Act. Located on the Academy campus at 300 Steamboat Road, Kings Point, the museum is open Tuesdays through Fridays, 10 am to 3 pm. Its collections include a substantial range of ship models, maritime artwork, historic and modern navigational tools, and china from shipping companies around the world. The museum has an exhibit on World War II convoys and the "142 Gallery" dedicated to the 142 USMMA midshipmen-cadets lost in enemy action during that war. Pictured: World War II Japanese Surrender Sword Analyzed by Metropolitan Museum of Art Expert - Metropolitan Museum of Art Special Consultant for Japanese Arms and Armor, Mr. Morihiro Ogawa, examines the American Merchant Marine Museum's Japanese surrrender sword. Metropolitan Museum of Art Special Consultant for Japanese Arms and Armor, Mr. Morihiro Ogawa, examines the American Merchant Marine Museum’s Japanese surrender sword. Subject: LongIsland.com - Your Name sent you Article details of "American Merchant Marine Museum Reopens – World War II Japanese Surrender Sword Analyzed by Metropolitan Museum of Art Expert"